Prosecutors hope to use a text exchange between James Alex Fields and his mother, in a murder trial related to the 2017 Charlottesville white nationalist rally. 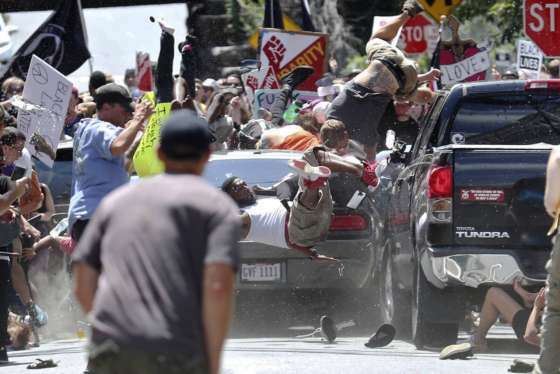 WASHINGTON — James Alex Fields told Charlottesville authorities he thought he was in danger when his car collided with a crowd counterprotesting 2017’s “Unite the Right” rally, killing one and injuring dozens. On what was the final day of prosecution witnesses, prosecutors showed jurors a text message James Alex Fields sent to his mother — which included a photo of Adolf Hitler — to demonstrate he expected a violent confrontation at that white nationalist rally in Charlottesville. On Tuesday, jurors heard from detective Steve Young, whose body-camera video of Fields being searched provided jurors their first chance to hear Fields’ voice. “I’m sorry that — I don’t know. I didn’t want to hurt people, but I thought they were attacking me,” Fields told Young. Later, in a police headquarters interview room, Fields was read his Miranda rights, and declined to speak. When told several people were severely injured and one had died, Young testified Fields hyperventilated for several minutes. At the Charlottesville jail, when questioned by magistrate, Fields said he was trying to leave the scene, and saw a crowd gathered around the cars in front of him. He didn’t describe the crash to the magistrate. In another call, several months after the crash, Fields described “getting mobbed by a violent group of terrorist,” and described “antifa” — or anti-fascists — waving ISIS flags. 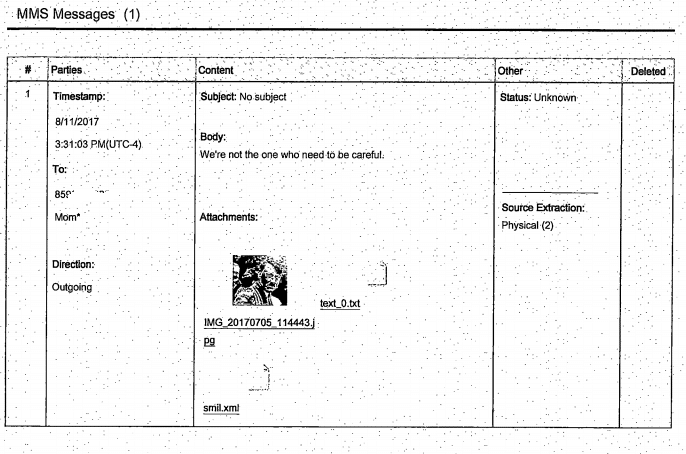 Earlier, Charlottesville prosecutors were granted permission to show jurors a text exchange between Fields and his mother that they say shows his intent, motive and state of mind on Aug. 12, 2017, when Fields drove his car into a crowd of counterprotesters at the Unite the Right rally. Three days before Fields left Ohio for Charlottesville, he texted his mother, “I got the weekend off, so I’ll be able to go to the rally,” according to the prosecution motion, which asked the judge to rule the text exchange admissible as evidence in Fields’ trial for the murder of Heather Heyer and malicious wounding of dozens of others. On Aug. 11, as Fields departed for the rally, his mother texted, “Be careful.” Fields replied: “We’re not the one [sic] who need to be careful” — together with a photo of Hitler. The defense argued that showing the text exchange to jurors would be unfair and prejudicial. Commonwealth’s Attorney Joseph Platania said the image is relevant to Heyer’s death and the injuring of various others. In its motion, the defense argued that courts have declined to admit evidence of other defendants’ affinity for Hitler, saying it risked confusing or misleading the jury. After the prosecution rested, Fields’ lawyers had their opportunity to call witnesses. WVIR-TV in Charlottesville reported that the first witness for the defense was Officer Tammy Shifflett, who directed traffic in the area Aug. 12. She recounted how a violent, angry crowd was fighting, and that she had to fall back when she felt the effects of tear gas. Deputy Paul Critzer of the Charlottesville sheriff’s office took the stand next, recounting how he arrested Fields after a pursuit that lasted around five minutes. Critzer said he was on duty when Fields’ car passed him after leaving the scene of the crash, of which the deputy was still unaware. Critzer stopped Fields’ car at one point, and when the deputy stepped out of his squad car, he told jurors, Fields’ car took off again. Critzer stopped it again 100 yards away. The defense is expected to call seven or eight more witnesses to the stand on Wednesday. If convicted, Fields faces the possibility of life in prison.